Designed for developers, by developers. 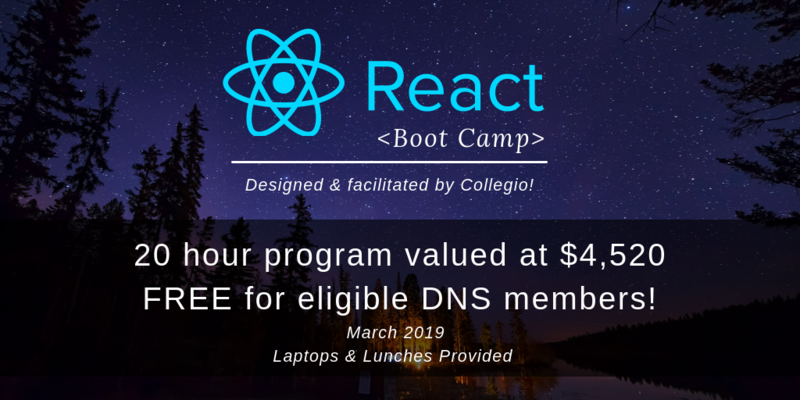 Learn how to build, maintain and launch real-world web applications through this 10-session React Bootcamp. Combining theory and application, you will produce your own apps and complete the program with the core knowledge required to deeply understand and begin building and testing robust web apps in React. Component-based architecture is where front-end development is going, so whether you’re starting development of your new product, looking for a front-end overhaul, or even just seeing what’s out there, React can add value to your business. Rob is a programmer with over 15 years experience in web programming and software development, with a talent for solving complex problems and ensuring client satisfaction. A graduate of Dalhousie University’s Bachelor of Computer Science program, his mix of classical training and modern programming languages ensures that clients are not only satisfied with their product, but also have the means to continue servicing it in the long run. Previously, Rob worked as lead on projects ranging from website builds and mobile applications to server architecture, and is currently the CTO of Click2Order, an online ordering platform allowing restaurants to easily enable web and mobile ordering in their stores.